Since the beginning of their development, the passenger’s frontal airbag has probably been the biggest controversy in the automotive industry. The debate over the safety of passenger air bags has been an ongoing thing since the mid ‘60s. As a result, the problems with this system have generated most all of the new technology we see today. This is a the single stage, pyrotechnic inflated, passenger’s frontal airbag. Though they look a lot different than the driver’s airbag they work basically the same. The biggest difference is; to fill the larger space between the dash and the seat, the bag must be much larger. To fill this larger bag, at the same speed as the driver’s, a much larger volume of gas is required and it must be distributed over a wider area. Because of this and the lack of space in the dash area, most passengers’ airbag inflators are long rather than round like the driver’s. 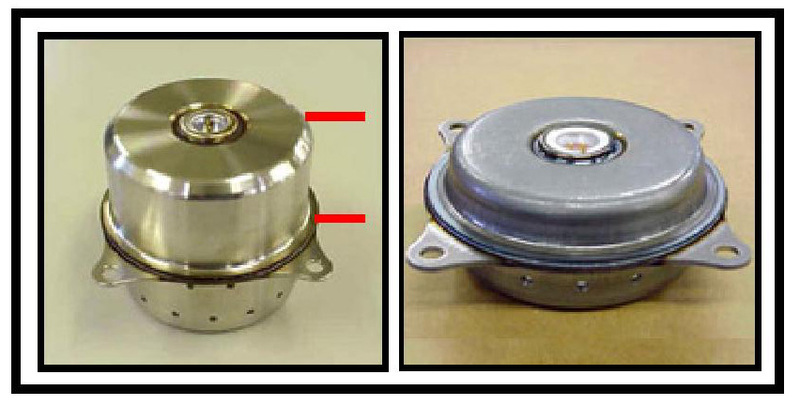 The round inflator on the left is one of the exceptions, but notice how much larger the chamber containing the propellant is, than the driver's airbag inflator on the right. Both the long and the round inflators work on the same bases as the driver’s, the igniter receives an impulse from the control module; it then heats the Sodium Azide, starting the chemical reaction that produces large amounts of nitrogen gas to feel the bag. Enlarge the picture and it is plan to see that some are very easily identified while others are totally hidden and deploy out from under the dash panel. One of the big problems with pyrotechnic type inflators is the extreme heat generated by the chemical reaction. The drivers’ airbags do have the same problem, but the larger volume of gas needed to feel the passenger airbag greatly increased the amount of heat generated. These gases are extremely hot when they enter the bag, but they cool with in milliseconds, although the inflator itself will remain hot for several minutes. The one shown in the picture was placed in a pool of water approximately 4 minutes after deployment. Enlarge the picture and you will see, it boiled the water for approximately 3 minutes afterwards. In later years, most manufacturers turned to a compressed gas inflator. These inflators no longer use Sodium Azide or any type of chemical reaction. They are simply a storage canister that is felled with compressed Nitrogen or Argon Gas. The pressure stored in most of these canisters is rated at 3000 psi. Some of the later ones, from about 2004-up, are rated at 4000-4500 psi. This compressed gas is held by a disc shaped bladder, much like a coke bottle cap. When the igniter is energized, a very small pyrotechnic charge melts the bladder and the gas is allowed to escape into the bag. Though some of the heat from this charge is necessary to cause these gases to expand, these inflators allow for a much cooler airbag deployment. These also eliminate another problem; the chemical hazards produced by the pyrotechnic explosion. As was mentioned before, it is estimated that about 2% of the cloud seen in the vehicle after an airbag deployment is actually smoke. This smoke is made-up of the chemical byproducts of the burning Sodium Azide, one being hydrozoic acid, a highly toxic gas. Another is sodium hydroxide, better known as lye or caustic soda. Both of these are very corrosive and can cause severe burns to all tissues that it comes in contact with, if exposed to too large of amounts. Inhalation of low levels of these as dusts, mists, aerosols or gases (Smoke) may cause irritation of the nose, throat, and respiratory airways. Inhalation of higher levels can produce swelling or spasms of the upper airway leading to obstruction and loss of measurable pulse; inflammation of the lungs and accumulation of fluid in the lungs may also occur. Another is potassium chloride or potash; this chemical when exposed to oxygen actually becomes what we know as baking soda. It very quickly absorbs moisture, drying and irritating the eyes and the membranes of the nose and throat. Though rare, these chemical can cause some physical problems and with the driver’s and passenger’s airbags deploying at the same time, the amount of these chemical is greatly increased. By using compress gas inflators much of this is eliminated. In the years prier to 2003; sixty six children and five adult passengers were killed as a result of passenger airbag deployments. As these reports began to develop a great fear of airbags was created, not only a public fear, but manufacturers as well. But, with federal standards mandating the installation of airbags in all cars sold in the US, manufactures were forced to keep the airbag, but develop a solution to this risk. Manufactures and after market companies began installing these cut off switches to protect children and small adults. In seeing so much abuse of the switch, the NHTSA soon stepped in, regulating the use of the switch, by categorizing groups who met certain qualifications. These persons could apply for a permit to obtain a switch in their vehicle. In later years; NHTSA allowed automakers to install on-off switches on new cars and light trucks that have no rear seats or rear seats that are too small to properly accommodate a child seat. Most of these switches must have a key to turn them on and off. 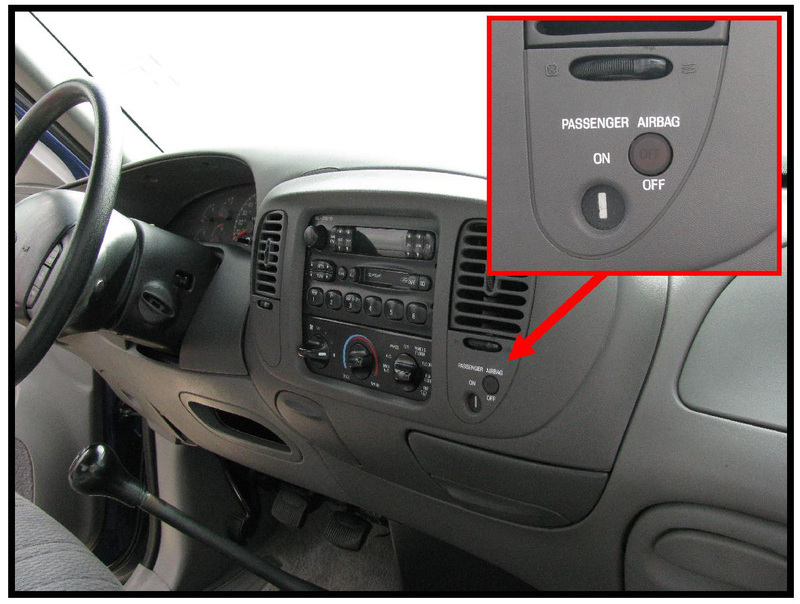 When turned off; a light on the dash will indicate that it is in the off position and that air bag will never receive a signal from the control module to deploy. This is accomplished by means of the cut off switch module mounted under the dash. With the cut off switch installed in so many cars and pick-ups, it soon became a new problem; people forgot to turn them back on, or mothers forgot to turn them off with the baby in the seat, along with multiple millions of forms the government had to file for these permits. Seeing these problems NHTSA issued a new amendment proposal to Federal Safety Standard 208 part 571; which would require all vehicles sold in the U.S. to be equipped with Smart Airbags. Smart Airbags is simply a general name given to these systems because, working with a complex system of sensors they are able to control their own deployment rate. Like the driver’s, the newer passenger airbags are dual stage, having a low side and a high side and are capable of deploying a second time. Unlike the high powered single stage, these deploy with about 25-30% less force. One of the earliest dual stage units was the Nissan. It actually had two separate round inflator modules. Like the single stage, some contain dual stage pyrotechnic inflators Shown in the top picture and others dual stage compressed gas inflators as seen in the bottom picture. The passenger Smart Airbags are a much more complex system than the drivers. According to the new standard, these systems must be able to providing protection from the proximity to the airbag, out of position occupants and occupants of all sizes from infant to large adult, both with and without a seat belt. As we have seen, throughout their history, the safety of children has been the biggest concern. In eliminating the problems of the cut off switch, manufacturers had to first develop a system that could actually distinguish between an infant, child, or adult occupant setting in the seat. 45 pounds or less was relayed as an infant or toddler. 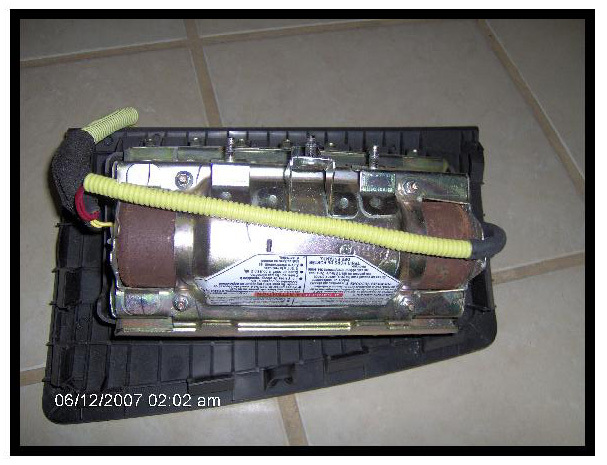 In this category the airbag was automatically shut off and would not deploy. 46-108 pounds was relayed as a child or small adult. In this category, depending on the severity of the crash, the low side of the airbag may have been deployed. 109 pounds and above was considered a full size adult. In this category, depending on all other factors, the high side of the airbag may have deployed. Today many manufacturers are using five category ratings, or thresholds. Like all other sensors there are many different types. One of these systems uses a silicon jell felled bladder. This bladder is mounted under the cushion of the seat, along with a pressure sensitive electronic device, to measure the weight mashing into the bladder. These work much like checking blood pressure. The sensor measures the amount of pressure applied to the walls of the bladder as the occupant’s weight mashes into it. Other companies came up with another sensor that went a little further. They use force-sensing resistors and silicon strain-gauges. Resistive pressure-point sensors are used to create a sensor mat, which is placed in the seat cushion. Each one of these sensors individually measures the weight applied to it, in turn forming an image or footprint of the passenger or object sitting on the seat. The system then electronically evaluates that footprint to determine the size of the occupant. By comparing the size of the pattern, setting on the mat, compared to the weight, it can give the control module a more accurate size of the occupant or object. In 2004 Bosch, Texas Instruments and others introduced the strain gauge type weight sensor, or Intelligent Bolts as Bosch calls them. The “iBolt” system measures the forces operating on the four anchor points of the seat frame. From that measurement, the weight on the passenger seat and how the weight is distributed are calculated electronically. Four of these sensors actually replace the four seat mounting bolts. As weight is applied to the seat these sensors measure not only the total weight but how much of that weight is applied to each corner of the seat. These sensors actually operate as two sensors in one, one being a weight sensor and the other being an occupant position sensor. These weight sensors pose a very dangerous threat to the safety of rescuers and EMS personnel. Old habits are hard to break, though not a good idea and highly discouraged, traditionally EMS personnel will run to the patient before rescuers have time to stabilize the vehicle and shut down the electrical system. Never enter, lean on, or lay any type of equipment on an empty passenger’s seat until the electrical system is shut down and the capacitor drain time has expired. As we have seen, these seats are equipped with hidden weight sensors that control the deployment of the passenger’s frontal airbag. If the seat was empty at the time of the crash, the airbag would not have deployed. With the electrical system still intact, any weight placed on the seat would alert the control module to open the path for a deployment. 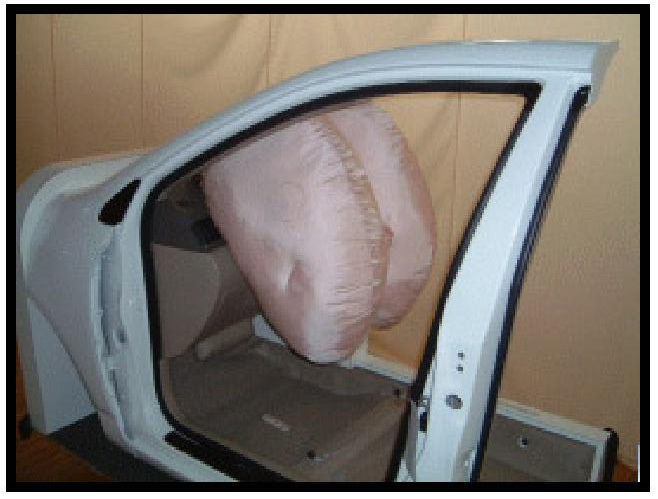 One of the other problems involved with airbag deployment injuries, is that though these systems could determined the size of the occupant, they did nothing to stop injuries to out of position occupants, such as a passenger leaning forward, falling asleep and leaning against the door, or turning side ways in the seat. The sensor mat does give some account of the occupant’s position by measuring the weight distribution across the pattern, but only that there is more weight on one portion of the pattern than on another. Indicating the occupant is leaning that direction. Today some manufacturers are using a series of flexible sensors that are embedded in the back rest portion and cushion of the seat. Using electric-field (e-field) technology an extremely low-level electric signal is sent to sensors embedded in the seat cushion and back rest. The human body conducts electricity; therefore when you set in the seat your body interrupts the flow of the currant, causing interference in the e-field. This interference forms and image of the person as shown by the dotted line in (Fig 1-6-17), by measuring the body mass based on the size of the interference it causes, the sensor can identify a child or adult. The level of interference is directly related to the size of the body – larger people create larger interferences, smaller people less interference.By calculating which sensors are being interrupted the system can determine what position the person is setting in and any movement they make. It also can determine the height of a child or small adult by determining the highest point of interruption. A double-layer flexible sensor assembly is installed in the seat cushion, the second layer being to calculate the weight of the person, classifying them with in the three or five categories we seen before. These sensors work simultaneously; the large sensor in the center of the back rest, combined with the reported weight, can determine the size of the person. It can also determine if the person is properly positioned in the seat. If the person is setting up straight, it will sense an image of their back, but if this sensor does not fine that image and the cushion sensors determines that there is a person, over 46 pounds, in the seat, then the system knows that person is leaning forward. The smaller sensor at the top center of the back rest can sense the height of a small child. If the sensor does not find and image and the weight sensor shows 45 pounds or less in the seat it will determine it to be an infant, and the airbag will be cut off. If the image is within the E field and the weight is 46-108 pounds it is determined as a child or small adult. If the image extends above the E field and the weight is above 109 pounds it is determined as a full size adult. The sensor along the edge of the seat can determine if a person is leaning on the door and will not allow the side impact airbag to deploy. Unlike the human body, items such as a briefcase or Child Restraint Seat cause very little interference due to the non-conductive nature of the objects and the airbag is automatically deactivated. One of today’s most advanced systems is Jaguar’s Adaptive Restraint Technology System. With Ultra Sound Technology; a full upper body image of the occupant them selves is transmitted, showing the actual size of the person, and the position in which they are seated. This gives the control module an accurate data to base its decision on. This system gives a very good example of the constant re-evaluation the control module is making as long as there is any electrical charge in the system. If a passenger is too close to the airbag deployment zone, or leaning to one side a warning light on the dash will illuminate showing that the airbag is inactive and will not deploy in an accident. The light will go off and the airbag reactivates when the passenger moves back to a proper position. By setting in the seat and moving side to side and leaning forward we can actually watch the changes the control module makes. How do these affect the rescuer? All of these will do the same but; the iBolt system is a very good example. We determined that the iBolt was actually two sensors in one, a weight sensor and an occupant position sensor. One of these sensors is mounted on each of the four corners of the seat frame, measuring the weight being applied to that area. Let’s look at a couple scenarios. We have an occupant in the passenger’s seat leaning against the door, putting more weight on the two right sensors than on the left ones, because of this the airbag did not deploy. One of the first things we learn in patient care is to hold C-spine, so like our tradition the EMS runs to the patient before the battery is disconnected, jumps in the back seat out of the deployment zone, and straightens the patients’ spinal alignment, equaling the weight on the two back sensors. Constantly re-evaluating every sensor the control module has now opened the path for an airbag deployment, because the patient is now setting in the proper position. Let’s say we had a small adult that weighed 107 pounds and they were setting in the proper position at the time of the crash. 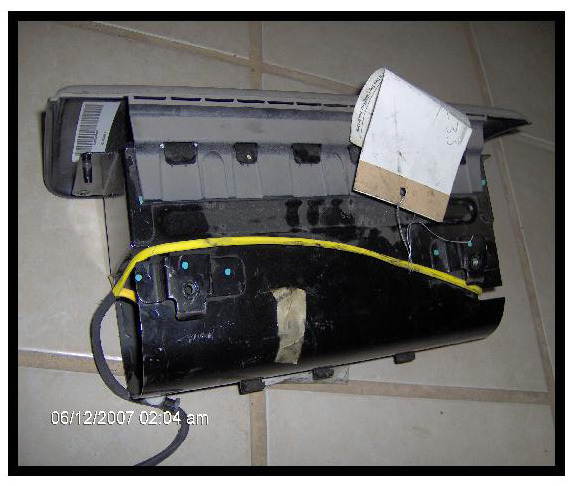 The control module may have deployed the low side of the airbag. Now the rescuer’s arms get tiered from holding C-spine so he rest his elbows on the back of the seat. That extra weight puts us into the full size adult category and being added equally to the two rear sensors, we just told the control module that we have a full size adult setting in the proper position for the second side to deployment. Keep in mind as we study this type of scenarios, that all of these are highly unlikely to happen, because the impulses did not reach the control module at the same time as all of the others impulses did, but if an accidental electrical charge is sent through the system they are all very possible. 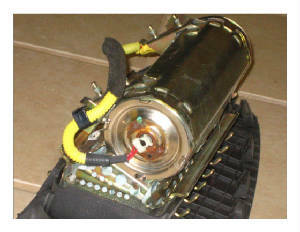 This is why it is so vitally important that the rescuer get the electrical system shut down, immediately, upon arrival. The dual depth air bag is designed to deploy two different size airbags. When the small air bag is required, a tether strap holds the air bag back to the smaller size, and a valve is opened on the back of the inflator housing to allow some of the gas to escape, as shown by the green bag in the picture. 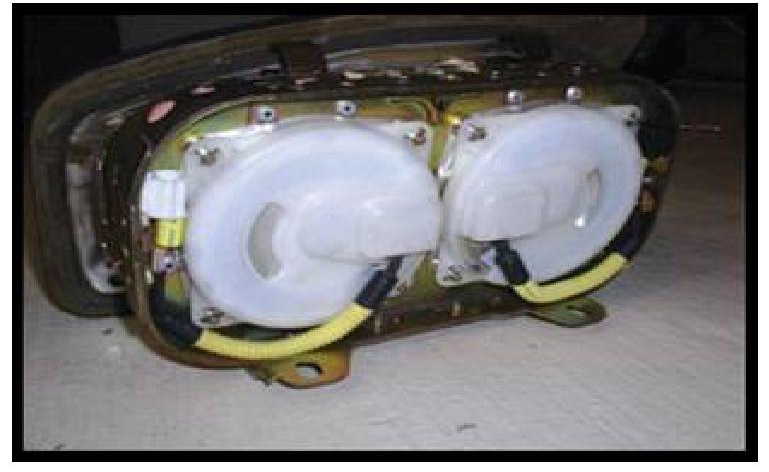 For the larger air bag deployment, the tether is released, the module-housing vent is closed, and the air bag is allowed to expand to its full size, as shown by the white bag. This bag was developed for Toyota, though it operates the same as other passenger airbags, when inflated it becomes two chambers forming a V shape in the center. 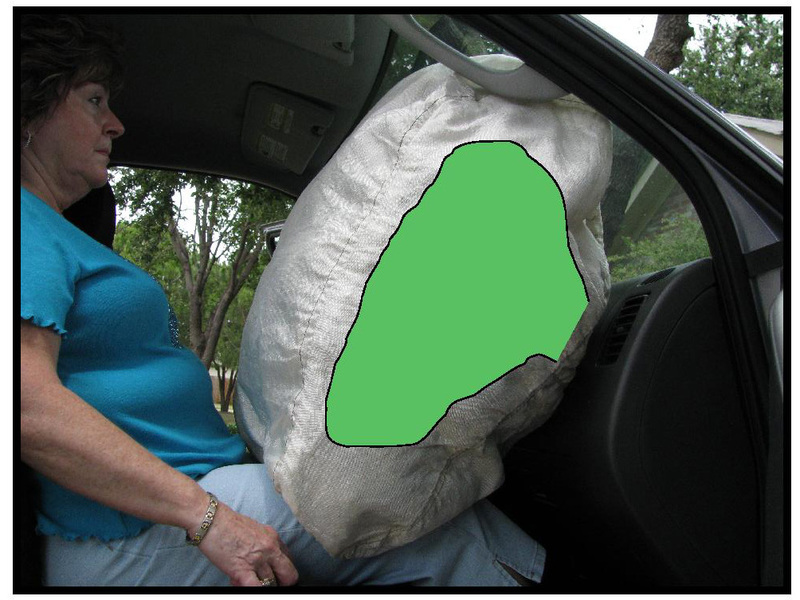 Most airbags have a flat surface when they are fully inflated; therefore as the occupant falls into the bag, the initial contact with the body is localized to the center of the chest and face. With the twin chambers this initial impact is distributed to two side surfaces of the face rather than one surface on the end of the nose and to the two shoulder areas rather than one localized point directly over the vital organs of the chest. By doing this, the impact force is distributed over four areas of contact rather than two, thus lessening the blow.